Stellina Aubuchon has been writing since 2003. She writes on health and communication issues for various websites. Her past writing experience includes her master’s degree thesis on college students' oral health. Aubuchon is working towards her doctoral degree in communication studies, with a specific emphasis in health communication, sensation-seekers and risky behaviors. 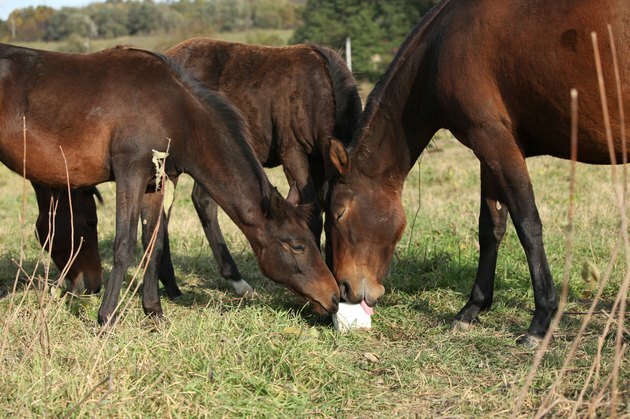 Salt blocks, also known as salt licks, are used by farmers for domesticated animals and by hunters to attract deer. Echonet.org states that salt blocks provide animals with the proper nutrients that they not only need but desire, and they can smell the sodium from far away. Make your own salt block with just a few basic ingredients. Mix together two parts rock salt, four parts bonemeal and one part of clay. Pound and sift the clay from a termite mound. Add enough water to the mixture to create a thick paste. Line a cardboard box with a trash bag. Pour the mixture from the bucket into the lined box. Allow several hours for salt block to harden. Remove the salt block from the box when dry. Peal away the trash bag and dispose. Use materials that you do not mind getting messy. For repeated measures, use the same mixing bucket, stick and box. Different geographical locations and altitudes may require more water than others to form the paste consistency while making the salt block. If your paste becomes runny due to too much added water, add more clay, rock salt and bonemeal.